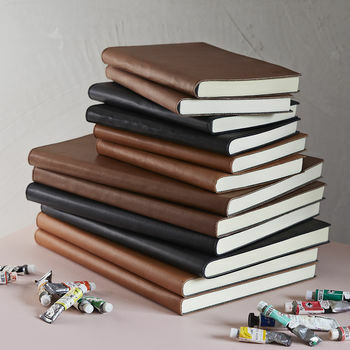 Leather gifts that will be remembered: either because of their originality and quality or because you added a thoughtful detail that could only come from you. 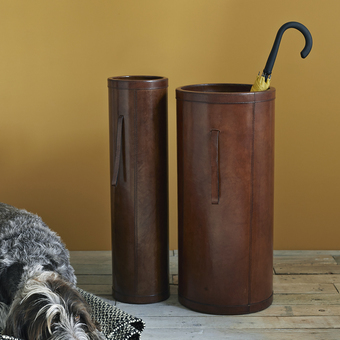 Add a touch of everyday luxury to your home, with Life of Riley's stunning collection of stylish, unique and beautifully crafted Buffalo Leather Interior Accessories. Signature pieces from the collection are perfect to give as special gifts for any occasion. 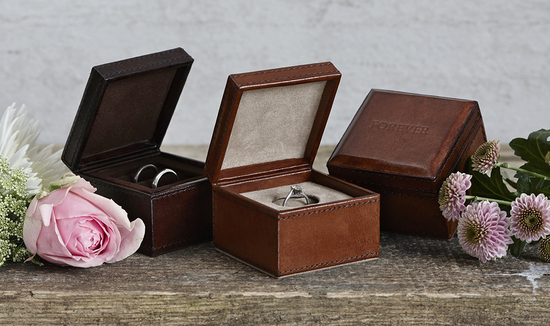 Ideal as wedding presents, leather is also traditionally given as a third wedding anniversary gift. 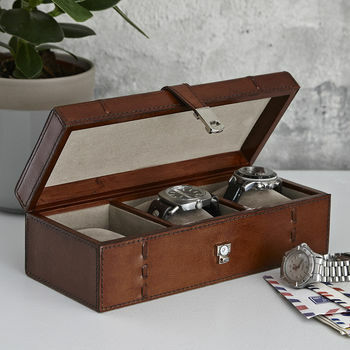 A birthday, graduation or retirement can be marked with a watch box or jewellery box embossed with your personal message. Simply treat you, your home, your office, or that important person in your life, to something very special. 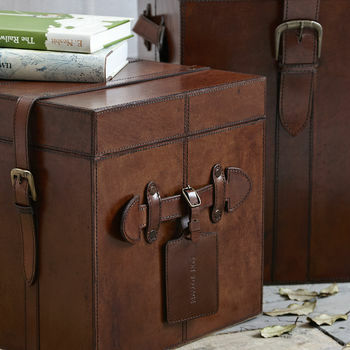 Life of Riley's hand-finished leather gifts and homewares are pieces to cherish and keep forever. Add an exclusive personal touch to your leather gift, celebrate a memorable date, personalise with initials or a name, even a company logo. 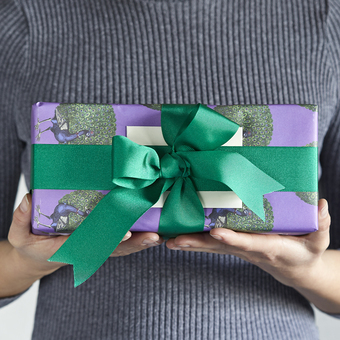 On selected lines, we offer free delivery, an optional express delivery, embossed personalisation and our luxury gift wrap service. "Product is of good quality brought the large several months ago and found a use for another so brought a small. They are a bit pricey but look really good together so worth it"
"This was purchased to match something else I'd bought before. Product is high quality and well finished. Quick delivery too even with the request for personalisation. Would recommend." "Beautiful, high quality leather and personalisation very clear! Thankyou!!" 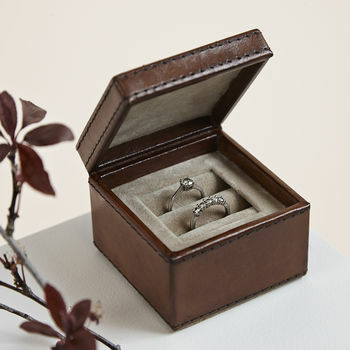 "The wedding ring box was very high quality, we ordered at relatively short notice and it arrived on the committed date. We were delighted with our purchase." All orders are sent by DHL tracked and signed for courier service, or 48 Hour Royal Mail tracked delivery service. Please note your tracking number will be sent with our confirmation that the order has dispatched. We do require your mobile number. 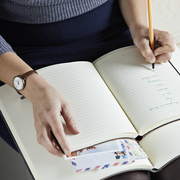 Personalised items take up to 2 working days to be embossed in addition to the estimated delivery time. We do not dispatch orders at weekends or bank holiday so lead times are working days. Please note personalised orders are non refundable non cancellable orders and cannot be exchanged. Please ensure the spellings and punctuation that are requested are accurate as we emboss what you order. Orders may be sent to a work place or alternative address if this is more convenient, but will require a signature. Parcels are sent in recycled outer packaging wherever possible. Most items are wrapped in tissue or bubble wrap inside a brown box but this is to protect the item in transit and is not a gift box. For a gift ready item please opt for our luxury gift wrap service and add the details to be handwritten on the attached gift card.